These paintings are recreations of murals from Iraq that have been vandalized or destroyed since Saddam Hussein's regime was toppled by America and its allies. Although it is often impossible to tell whether the original paintings were defaced by Americans or Iraqis, the graffiti is frequently in English (and rarely in Arabic). 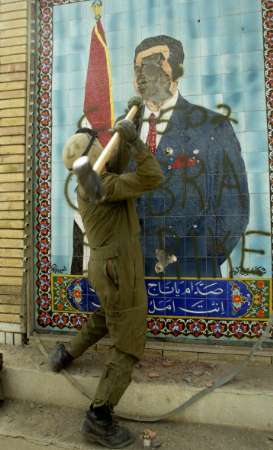 I have found many photographs depicting American soldiers driving tanks over murals, slashing canvasses, smashing painted walls, and pointing rifles at or urinating on portraits of Saddam. I understand the desire to remove symbols of a deposed (and widely despised) dictator, but I was surprised that there was no serious objection to the wanton destruction of these paintings. This stood in stark contrast to the international outcry when the Taliban blew up ancient Buddhist statues in Afghanistan the year before the US invaded Iraq. As far as I can tell, there was no effort to document the Iraqi murals before their destruction. 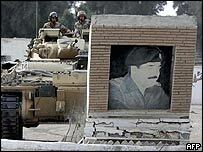 It is amazing how many of these murals existed in Iraq -- I have found hundreds of images on the internet. Clearly, Saddam Hussein's government had a large public art program (although the artists' choice of subject matter was limited). As I researched these paintings, I also became interested in the symbolism. The symbols must have been easily understood by common Iraqis, but to me they were often incomprehensible (even after considerable research). I see parallels between this basic lack of understanding of Iraqi culture and the mistakes the US has made in Iraq since deposing Saddam. I do not intend to celebrate Saddam Hussein with this project. Instead, it is an attempt to restore works of art that have been destroyed by my country's soldiers. It has been said that those who forget history are doomed to repeat it. 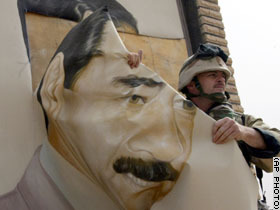 By recreating these paintings, I hope to further our understanding of Saddam-era Iraq.